To build 21st Century learning from the ground up, we look to see how companies like Google, Spotify, and GE build their innovative cultures. Their secret to innovation? Agile. Where focused teams unleash creativity, adapt through fast learning cycles, and iterate towards success. Agile Classrooms is a cross-pollination of Agile with modern learning and motivation research. 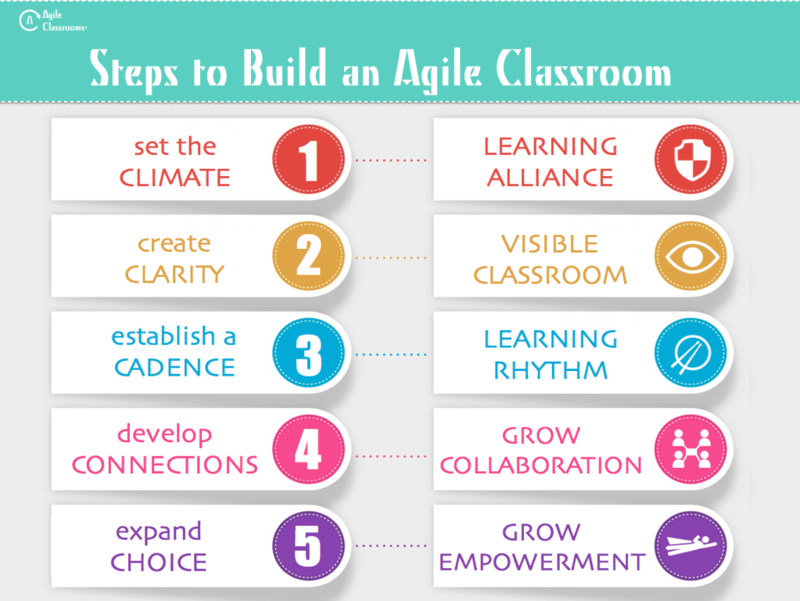 With Agile Classrooms, 21st Century readiness is built in. Agile Classrooms self-organize their own learning, use visual accountability structures, and are immersed in reflective feedback. It is a structured learning environment that restores the freedom to teach and learn. Where students reclaim responsibility for their own learning and teachers shift into facilitators and guides. How did we end up integrating the Agile Learning framework in Vietnam? It started when I was teaching our very first year of our student-led magazine course, Student Publications. I'd been struggling to create a self-organizing classroom, and in my research for strategies to achieve this goal, I came across John Miller's teaching resources. After a year of testing Agile in my own classroom, learning more about the model, and Skyping a few times with John, I invited John to Vietnam for our orientation program and to see what our teachers and students would do with Agile concepts and tools. The majority of our students transfer to us from public schools, and when given Bloom's taxonomy years later, they believe that the bulk of their work in public school was the bottom end of the triangle, focused on Knowledge & Understanding. I saw Agile as a way to jumpstart our students' critical thinking skills, as a main product of an Agile classroom is creation. My hope was that this framework could also empower students with collaborative and project management skills that will enable them to excel in high school, college, and beyond. How do you set up an agile classroom? Below you can see the steps our staff were given to set up an Agile Classroom. Teachers were not specifically directed to do anything with Agile, simply to experiment with what they learned in their professional development sessions as they saw fit. In order to track if and how teachers were using Agile, I conducted regular walkthroughs with an "eye for Agile" and chaired an Agile Learning Focus Committee for teachers who were particularly interested in implementing Agile in their classrooms. As the school's Curriculum Coordinator, I was fairly hands off with implementing the Agile framework. One thing I did do was to use one of our early professional development days to have teachers using Agile share with the rest of the staff. At the end of the year, we took half of another in-service day for these teachers to share evaluations and reflections of what they tried based on Agile learning strategies. In just one year, teachers have already taken Agile learning beyond what I had imagined. I'll share just a few examples. Our 9th graders take a semester-long course in Information Literacy, taught by the school Librarian, Elizabeth Cominole. Elizabeth re-designed her curriculum plan so that the course is organized around Agile principles. What I was most impressed with in Elizabeth's class is that the students had established a strong learning rhythm that was not dependent on a teacher-centered environment. Whenever I walked into Elizabeth's class, students were all completely engaged in their passion projects. Students had a real sense of ownership, not only of their research topic choices, but also of their pace and how they would be assessed. Elizabeth developed this teacher-student negotiated rubric to represent the skills they were learning and practicing throughout the course. Her term for it is the "Franken-rubric," as elements of it were taken from various 21st-Century Skills assessments. Elizabeth shared about her students' journey creating the rubric at our final in-service day of 2016, and several teachers expressed they would also like to adopt the rubric for collaborative projects. I love that Elizabeth produced this assessment tool based on real student input and experience with the Agile model. One of the things administrators struggle with is finding time in school's overall curriculum plan to fully implement new learning initiatives. I had not planned to offer a specific course in Agile learning in our grades 6 to 12 program, but rather to see how teachers would utilize Agile strategies in the classroom and during extra-curricular activities. After a year, we'd evaluate and see where we were at with embedding all the tenets of Agile across grade levels. If you walked around the school, you'd see Agile task boards (known as scrum boards) for the Global Issues Network, the Film Club, the English Department, and the Student Publications group, and even the Senior Leadership Team. However, the most exciting thing that happened in our school last year was that two teachers decided to combine forces to pilot a course focused primarily on Agile learning. How did that happen? The day after our Agile Classrooms Teacher Certification workshop, John Watson (Technology Teacher) and Darren DePass (Athletics Director & Physical Education Teacher), came with a proposal. I'd assigned them each a section of 8th grade for an elective. The original plan was for John to teach a Technology skills course to half the group for one semester, and for Darren to teach a Physical Education course to the other half of the group. Then at the spring semester, they would switch. This meant that between the two of them, they had ALL the 8th graders at the same time. Darren & John's idea was simple. Put all the 8th graders together, identify a project, set up some scrum boards, and give the students control in order to activate Agile learning. They would focus on the tenets of Agile while also teaching some key content in their curriculum areas. How would students be assessed? Darren & John had some ideas, but really, they were going to figure it out as they went along. Below is the Agile wheel showing the 5 elements they wanted to include. Watching this course develop over the course of the year was fascinating. John & Darren's biggest challenge was getting the students to understand and buy in to the concept of Agile learning. One may assume that students would relish their newfound freedom, however many of them struggled with having to set their own goals and learning rhythm. Darren related a story of one student being so overwhelmed that he locked himself in the bathroom and cried because it wasn't something he believed he could do. During the first term, many students felt confused with the course structure. Visiting this class was similar to visiting Elizabeth's class, in that the students were self-organized and the teachers acted more as advisors and coaches. The major difference was that students could choose to work in the PE court, the library or the technology lab, and they had so many different variations of their Positive Impact Project going on, that an outsider would think this group of kids was on extended recess. If you looked a little closer, you'd see that this was Agile in action. Overall, the course was a success. In their final reflection presentations, which each student did individually, the students wrote about the fear they had about what they were trying to achieve in the beginning. John and Darren shared that many students "felt pretty useless" at first, but then realized the value of positive communication and teamwork. By the end of the course, they were ultimately self-motivated and self-organizing. John and Darren shared that the most challenging thing as teachers was to let students learn from their own mistakes, and that as teachers they often had to "bite their tongues and remove themselves" when they saw students off task or far away from meeting their deadlines. However, they saw that holding their tongues and allowing students to self-reflect served as the "great equalizer" in the course, and that by the end, this transitional experience provided an excellent preparation for high school, when students really need to start taking responsibility to meet deadlines and prioritize their time. That student crying the bathroom? His dad came in to parent teacher conferences and gave Darren a huge smile while he lauded the school's efforts to make his son more of an independent learner and to push him out of his comfort zone. As John shared, "a thread that has run through the entire course is that this is THEIR course, and they've been responsible to make the class their own." As teachers, both of them realized a critical component to making the model work is time-boxing, setting strict time limits and deadlines in order to keep students focused on their tasks. While we all agreed with John's assessment that this course would be a gamble, everyone was happy with how it turned out. We've added it to our core curriculum sequence, so all 8th graders at ISHCMC - American Academy will now take 21st-Century Skills as their final middle school elective. A key component of the Agile model is multiple iterations, so I'm excited to see what John & Darren do for their second iteration of the course! To hear about this journey from John & Darren themselves, visit John's website and watch their Agile video collection.